April 12, 2019, peacefully, at home, dearly-loved husband of Rachel. House private please. A Service will be held in Fleming & Cuthbert Funeral Home, 141 Mill Road, Ballyclare, BT39 9DZ on Tuesday 16th April at 11.00 a.m., followed by interment in Ballyclare Cemetery. Family flowers only please. 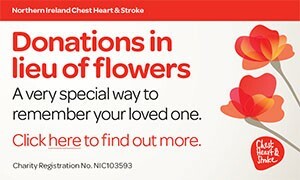 Donations in lieu, if desired, to Chest, Heart and Stroke, c/o Fleming & Cuthbert Funeral Directors at the above address. we'll be beside you every day. Deeply regretted by sister-in-law Belle, brother-in-law Fred and family circle. Deeply regretted by cousin Jean and family circle. Deeply regretted by sister-in-law Anne and the family circle. I am sorry to tell you that Henry YOUNG has passed away.